LEWISTON, IDAHO -- Federal officials have started releasing water from Dworshak Reservoir in northern Idaho several weeks earlier than normal to cool areas downstream for federally protected salmon. The Lewiston Tribune reports that the U.S. Army Corps of Engineers on Wednesday increased the amount of water leaving the dam from 2,900 cubic feet per second to 5,200. Officials say the 42-degree water will cool areas at Lower Granite Dam on the Snake River in southeastern Washington. 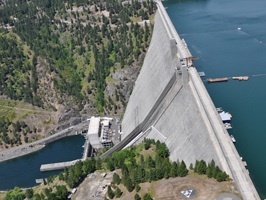 "It takes about three days for cold-water releases from Dworshak to reach the downstream side of Lower Granite Dam, where the target temperature gauges are located," said Steve Hall, reservoir manager for the corps at Walla Walla. "So, we have to plan well ahead and make adjustments at Dworshak that will be effective at the time we'll need them farther down the river." Keeping water below 68 degrees is part of a federal plan to mitigate the effects of lower Snake River dams on juvenile salmon and steelhead. On Tuesday the water temperature was at 67.3 degrees. Officials say that a small snowpack in the mountains that feed the Snake, Salmon and Clearwater rivers meant a low spring runoff and now early high water temperatures. Releases from Dworshak Dam usually begin after the Fourth of July holiday weekend and go through mid-September, dropping the reservoir about 80 feet. That timeframe is intended to keep the reservoir full early in the summer for anglers, boaters and campers. Once the reservoir drops about 20 feet below full pool, camping becomes difficult. However, when the reservoir drops a few feet that can make it better for campers. "When the pool drops down several feet, much of that debris stays on the shore, and beaches become exposed at almost all of the shoreline camps," said Paul Pence, the corps' natural resource manager at Dworshak. "We like to see the lake full, but boating and shoreline camping is actually easier when the water is down a few feet."